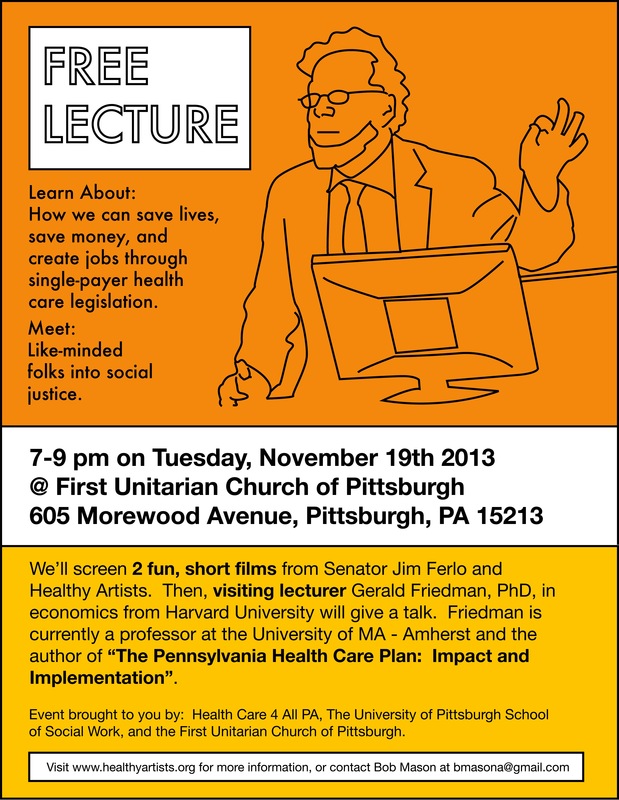 The event will kick off at 7pm at the First Unitarian Church of Pittsburgh with two short films, from Senator Jim Ferlo and Healthy Artists (that’s us! ), also featured in the HuffPo piece. Next, Friedman will explain single-payer healthcare and his 2013 economic impact study showing how single-payer legislation SB400 would save PA $17 billion annually. The bill would also create over 100,000 jobs and provide comprehensive medical, dental, prescription, vision, and mental health care coverage to all citizens. The talk will be followed by a Q&A, and participation is encouraged. Can’t wait to see you there! This event is sponsored by Health Care 4 All PA, the University of Pittsburgh School of Social Work, and the First Unitarian Church of Pittsburgh. See the full press release. Why isn’t Single Payer an Automatic Slam Dunk for Pennsylvanians? Are we that stupid? “Like, uh, here take most of my money so I can have inferior health care coverage and not afford to go to the doctor!”.